I've got to say that I really enjoy playing Zelda! And I'm not talking about the newer games, since I haven't yet had the chance to play them, but I'm talking about the good old sprite based Zeldas. 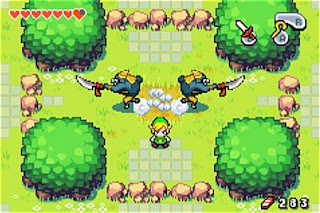 I'm currently playing "The Minish Cap" (not that old but retro anyway) which is a beatiful upgrade of the Zelda 3 look and feel, even though they could have added a couple of hours work on the story. But that's not why I'm playing zelda. It's because of the simple arcade style combined with the terrain/item puzzles. I like them so much that I suspect I'll add something like it in Soulreaper. I've been thinking about clever ways to temporarily block off areas and Zelda has got a lot of them. After deciding to go for a simplistic level-up system and simple items as well, I'm suspecting this might be a good way to get the game a bit more interesting. Certain areas of each level might be locked so coming back later will reward you. Perhaps you'll get an item or even a sub quest. Depending on how complicated the level generation algorithm is going to be, these sub quests could either be locked to that level or they could contain different parts in different levels. It's of course important to make sure the level generator doesn't cause a deadlock situation where you need A to get to B, but you need B to get to A. In Zelda you either get items or upgrades to get to new areas. I'm expecting upgrades might be the best way to handle this in Soulreaper because of the simple item system. You could for instance get new skills by being trained by a mentor, helping a demon or perhaps sucking the soul from a seraph. So quests will be generated? How complicated are you going to be able to make them? etc. Now there's no problem to randomly generate what X, Y and Z shoud be in the different quests. Combining these shouldn't add too much to the complexity either. This will not be how the main quest is handled but it might be a way to add a couple of side quests.